Turning off or disabling RSS Feeds of a Blogger blog might sound outrageous, but it could be handy for a few cases. If you don’t want your subscribers to get any kind of Email notification of new posts, or your RSS Feeds is used by some copiers to rip off your content via automatic scripts. Both problems have a mutual solution either turning off the RSS Feeds for a definite period or absolutely change to a new Feed Address (this sounds quite funny). 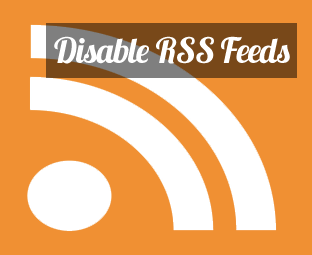 In this article, We will show you, How to Turn Off or Disable RSS Feeds in Blogger? 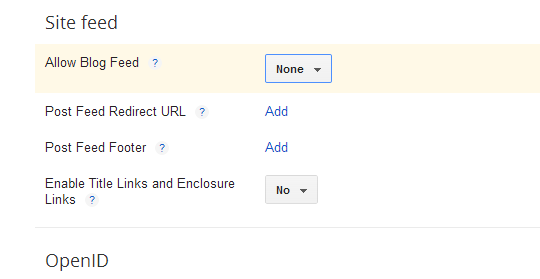 The first thing you need to do is to login into your Google account associated with Blogger.com. After logging in head over to the Blogger Dashboard and select the blog in which you would like to turn off the RSS Feeds. After selecting a blog, go to Settings >> Others >> Site Feeds >> Allow Site Feeds >> Where you will notice a few options. We have explained each and every option below so that you can choose them accordingly. Full: This displays your whole content in Feeds. 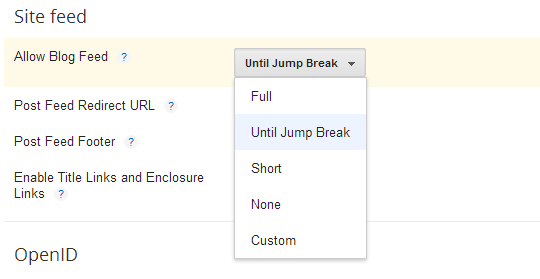 Until Jump Break: This displays your content until the jump break. Short: This automatically displays short portion of your content in feeds. None: This is the option which completely disables the RSS Feeds on your site. Since, we’re working to completely disable the RSS Feeds from Blogger site, so you have to select “None” from the drop down menu. After selecting it, press the “Save setting” button located on the top right side of your screen. Congratulations: You have successfully disabled RSS Feeds from your Blogger site. However, if you want to again re-enable the Feeds, then you can choose either “Full” or “Until Jump Break” from the settings. We hope this tutorial may have helped you in learned how to turn off or disable RSS Feeds in Blogger. Still there is no need to turn it off until there is no strong reason behind it. Once you turn it off, you cannot use any services offered by RSS, so its either you turn it off or you enjoy the stuff that provides quite a few benefits. Now the choice is yours.